Born in Smyrna, Delaware, Dolores began her singing career in 1989 when she joined the Office of the Black Ministry Choir and toured with the group to Italy, performing in Venice, Florence, and Rome at St. Peters Basilica. In 1994 the Black Ministry Choir was reformed into Voices of the Spirit under the direction of Mark Howell. The Voices of the Spirit Choir was noted for its highly acclaimed performances at the Apollo Theater, Radio City Music Hall, and numerous church concerts in Manhattan. Dolores was also a member of The Crystaltones. In 2005, she became a member of the Mark Howell Singers, a group sought after for performances at Carnegie Hall, Lincoln Center, Harvard University’s Bicentennial Anniversary, and community concerts throughout the five boroughs of New York City. On her own, she has performed as a back-up singer for Billy Preston and Darlene Love at the Manhattan Center in 1999. 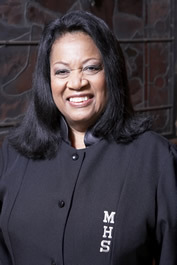 For the last 10 years Dolores has also performed annually with the Vicariate Choir at St. Patrick’s Cathedral in Manhattan during Black History Month. O Love that wilt not let me go, I rest my weary soul in Thee. I give Thee back the life I owe, that in thine ocean depths it flows, may richer fuller be. O Joy that seekest me through pain, I cannot close my heart to Thee. I trace the rainbow through the rain, and feel the promise is not vain. That morn shall tearless be. An immeasurable void is left with the Mark Howell Singers having lost Dolores in December of 2010, just a day after Christmas. We needed Dolores Butcher here with her sweet melodious voice, but the Good Lord needed her more for his Heavenly Celestial choir. She always shared an encouraging word, a sweet smile, great hands massaging my shoulders after having played and conducted for 2 hours at rehearsals, sweet words of consolation with the loss of my beloved mother, her motherly countenance towards all of us, the joys of her spiritual presence – are just some of the things that I miss about Dolores. Rest in Peace our Dear Beloved Dolores.